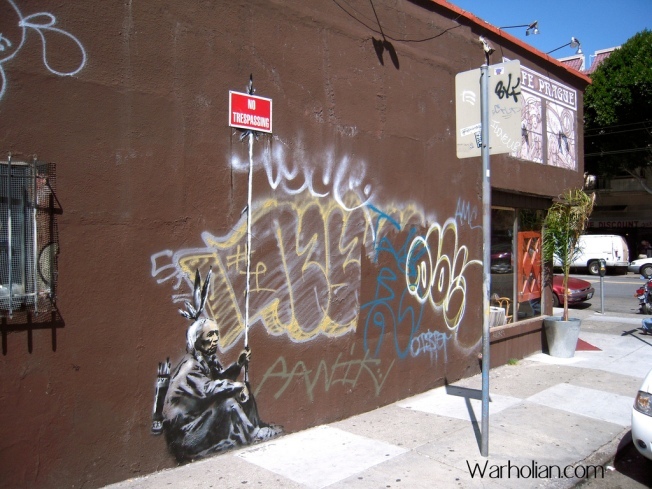 Banksy's somewhat tone-deaf ode to Native Americans has been upgraded by a fellow prankster to now feature Frank Chu. After popular British street artist Banksy left his mark on San Francisco's Mission District, a local prankster has left their mark on his mark. A stencil of a Native American bearing little resemblance to the actual Ohlone who once lived here was painted to hold a "No Trespassing" sign near the corner of 17th and Mission. It has since been edited to feature the face of famous local sign-carrier Frank Chu with a sign reading "Snarkymcrific banksytronical 42 galaxies 'n s**t zegnatronocalized Chu knew flibbertygibble." While street art fans were probably heartened to see the Banksy piece in Chinatown being cleaned up after some "editing," in this case the edited version may be better than the original. Jackson West figures the stereotypical Native American image might have been better suited to Alcatraz.